Mayor Barrett announced on Monday December 6th that bids would be advertised December 10th for the proposed $30 million exterior remodeling of City Hall. The mayor also set a Disadvantaged Business Enterprise hiring goal of 18 per cent and a 25 per cent City residency goal for the project. He delivered this news under the portico of the 1895 building on a foggy, rainy morning, and displayed a 108-year old construction photograph of the building featuring 18 of the workers who built it. Half were black. “When City Hall was built, it was the third-tallest building in the nation,” the mayor reminded the audience. It was also among the first sizable buildings to include modern heating, lighting, plumbing and other mechanical and structural systems, including a number of prefabricated items. Further study is warranted to determine the variety of tasks performed by the black workers on the project, but they almost certainly included semi-skilled and possibly skilled labor, stereotypes notwithstanding. 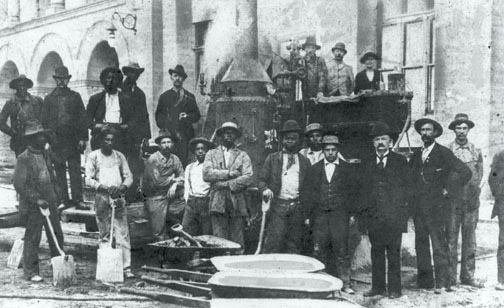 In the photograph, only black workers have shovels in their hands, including one well-dressed gentleman who hardly seems attired for hod carrying. The shovels may have been a photographer’s prop to keep the workers steady during the long exposure. Importantly, not all black workers have shovels, which leads us back to still-vital issues of black employment in skilled trades. Work will begin on the south tower in Spring, 2005, so the estimators at the bidding contractors better get their pencils sharpened mighty soon. The mayor did not specify what was meant by the term “Spring.” According to the dictionary it is a common seasonal occurrence elsewhere, but has no meteorological significance to Milwaukeeans. After the south tower is fixed, work will move on to the west, north and east facades in that order. What About That Dreadful Scaffold? At the press conference on the reconstruction of City Hall, I asked the mayor if any provision had been made to ensure that a non-intrusive scaffold would be included in the project, instead of the godawful thing that defaces the building now. The Mayor expressed support in principle for an attractive scaffold / protection platform, preferably one that might mimic the graceful arches of the present building. The existing scaffold, in place for over a year, is designed to keep the building’s pieces from falling on our heads. It is awkward and cumbersome, and is exceedingly difficult for pedestrians to navigate. It has made a nearby bus stop practically unusable, and if, beneath the plywood shelter, your path might be blocked by a television camera, a wheelchair or even a baby stroller, then you are out of luck, since there is no passing on this highway. I have an idea that might make this happen and I will make a phone call tomorrow. Anyway, the Mayor is open to suggestions about this scaffolding. Just remember that, bidding contractors – this could be your edge. I hope we don’t have to wait for Whitney Gould to get involved before this idea takes off. We can do it on our own! If Dan Hoan were known for nothing more than being Daniel Steininger’s grandfather, he would still be accounted a great man. As it is, he did more than sire the mother of the Chairman of the Catholic Knights, he was also Milwaukee’s mayor for 24 years. Early in his administration Hoan ordered that the Solomon Juneau, as City Hall’s giant bell is known, be silenced since he feared its vibrations were weakening the structure of the south tower. Well, that’s what he said, and I believe the City Engineer backed him up. I always thought Hoan’s reason was a bunch of hooey, and that he just didn’t like the noise, which, in 1920, was probably more pronounced, since the ambient noise was much less. For the same reason he probably was more sensitive to the vibrations emanating a couple hundred feet directly above his office. The bell remained silent – except for one burst each Fourth of July – until January 1, 2000 when then-mayor John O. Norquist gave the bell’s rope 12 pulls to chime in the new year. He then handed the rope to me, and I gave it a 13th ring, satisfying a long-held impulse. Since that time the Solomon Juneau has been counting the hours with regularity. I asked Chuck Engberg, whose architectural firm prepared the documents for the reconstruction of the City Hall bell tower, whether his firm had encountered any structural damage due to the bell’s ringing, and whether structural repairs or reinforcements would be part of the upcoming project. “The bell is fine. The tower is intact,” he said. The main problem with the tower, and with much of City Hall along with practically any masonry building of its age and construction – or of any age – in this miserable climate, is the effect of prolonged water invasion into joints, porous stone, wooden window frames, corroded metals and other appurtenances of the building, or any building. Structurally, City Hall is fine, he said. Still, the fact remains, and history shall record: our City suffered in silence for eighty years based on the faulty engineering assumptions of Mayor Daniel Hoan. Think of how many good citizens lived full lives, even voted the Socialist ticket, yet who went to their graves without ever hearing the dulcet tones of Solomon Juneau. Let his voice never again be stilled and let it always chime from high atop the Great Hall of the People! Last week we visited the topic of Broadband, which you could loosely define as encompassing the future of everything for this city. With such significance, it is no surprise that Broadband is of importance to all cities, including many much larger than Milwaukee. Should we give up, and let the flow of information to our homes and businesses remain a trinkle while it gushes in such outposts as New Zealand, China, India and Africa? If not, then what natural advantage does Milwaukee possess that would enable it to enter the front ranks of information centers? The answer: our unique and foresighted infrastructure. In 1890 the City of Milwaukee created a municipal conduit system to interconnect the fire and police stations with call boxes. Local residents recognize these old call boxes as ornate cast iron columns six feet tall and usually painted blue. The call boxes were distributed along the paths of the beat cops, providing a means of landline communications within each four-block area. Over the years these municipal rights-of-way have been upgraded and expanded to include street light power, light and traffic control systems as well as communications links between city offices, and other uses, some classified. Pre-existing conduit can dramatically reduce the cost of installing fiber-optic cable. That conduit can be used to deploy high capacity broadband throughout the city – not simply on trunk lines like Broadway, as is the case now. Few cities could be as easily “wired” (and “wirelessed”) as Milwaukee; the cost savings could be sufficiently significant to place us at an international competitive advantage. Our city neighborhoods would pulse with information, and companies would be attracted to our city. Milwaukee proudly markets its many virtues, yet its sales pitch often falls on deaf ears. In the global information economy, companies are not particularly interested where they locate – the work can be anywhere on the planet, provided the locality has sufficient and dependable broadband. Milwaukee was known as the city that produced nuts and bolts. We made the machines that made the infrastructure of other cities. Now, in a service and information economy, it is vital that we pay attention to our own superior infrastructure and adapt the 19th century marvel to its 21st century promise. It is not a technological hurdle we face. Despite the fact that “we ought to be aggressively pursuing getting broadband built-out in this city,” according to City Information Officer Randy Gschwind, “we may have lost business,” due to a lack of a comprehensive strategy – a will – to get the job done. It doesn’t help that the legislature has made it exceedingly difficult for municipalities to set up their own broadband entities (so long, Sewer Socialism), or that the weak, expensive broadband we have now is controlled by two businesses whose lobbyists show up at the door anytime an alternative is floated. Milwaukee must find a way to be a pioneer in the future economy. The city might have to knock on a few doors before the capital finds us, but with the availability of our superior municipal conduit system as an asset, the money is probably out there waiting. Most importantly, we must find the way to act quickly, for once, before our precious 19th century asset is merely an artifact from bygone era, a time when Milwaukee was a technological leader. According to news reports, Steven S. Zielinski, a 46-year-old City of Pewaukee man, was pulled over early Friday December 3rd, by Waukesha County deputies in an automobile belonging to Pewaukee mayor Jeffrey Nowak, who was a passenger in his car. We can imagine that Nowak, drunk, decided his friend should drive. Perhaps he should have determined first if his friend was also sober. The curious matter is: what were Jeffrey Nowak and his car both doing in Waukesha County? The two are very often found at Nowak’s Milwaukee address – 413 N. 2nd Street, where he has long maintained a property in the loft building redeveloped by buddy Ron San Filippo. Nowak’s sporty vehicle, which I would rather not otherwise identify, is often parked there, presumably while the mayor is walking to the numerous drinking establishments in the neighborhood and then straight home to his downtown pied à terre. Nowak was not cited in the automobile incident. Although the Milwaukee Journal Sentinel reported that “Zielinski was issued a citation accusing him of a (sic) drunken driving,” nothing seems to turn up when I search the Circuit Court records. The Milwaukee Journal Sentinel features a Sunday column by Patrick McIlheran, a conservative writer the editors discovered on the newspaper’s design desk, where he presumably toils the rest of the week. Last Sunday, December 5th, he brewed up an essay about “commercialism,” and that it is not as bad a concept as some might have us believe. He goes on for a bit extolling courtesy and sociability, which he argues are useful tools in the service industry. No argument there! He then stretches his thesis a bit (and confuses his audience) by saying “nor does commerce preclude moral content,” offering up the example of “Coffee With a Conscience,” which he refers to as a “downtown spot where the beans have agendas: They’re organic and grown by farmers paid better than market rates.” The profits are used as seed capital in the growing regions, he explains. Frankly, I think it is McIlheran who sounds smug, and I have a feeling he is picking on Coffee With a Conscience just because it represented a convenient target to suit his predetermined agenda. You could say he “phoned in” his research. Read the email I sent to him, and I think you’ll see why I feel that way. I note from your Sunday column that some people buy their coffee from “Coffee With a Conscience,” and that you do not. I think it would be safe for me to venture that in fact, you have never visited “Coffee With a Conscience,” which does not seem very conscientious on your part. I gather this from your reference to it as “a downtown spot.” That it is, indeed, without question. Those of us who have been there would invariably refer to its location somewhat differently. We would refer to it as the coffee shop that is located in the Central Library, one of the most significant architectural “spots” in the City. Subject: Re: caffeine by proxy? didn’t expect to spend money at the library). things from my column to make it fit.